If you are not in the City limits and would like to fill out a petition to be annexed, Click Here. Your completed annexation application must be remitted to the City Clerk at City Hall, 7875 Moffett Road #F, Semmes, Alabama 36575. Until the property is contiguous with current City limits. the property will be listed as “pending” status. If contiguous, the City Clerk and GIS Coordinator will present potential annexation to City Council who will vote to approve or deny the annexation petition. Towncharts.com provides information and data about every geographic location in the United States, including cities, counties, and zip codes. This data is collected from a variety of sources to include the Decennial Census, Department of Labor, American Community Survey, Census Bureau International Database, CIA World Fact Book, and Center for Medicare and Medicaid Services (CMS), Bureau of Labor Statistics, Common Core of Data, Census Bureau Current Population Survey and the Organization for Economic Cooperation and Development. 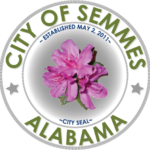 Click here for detailed City of Semmes Demographics. For further questions regarding mapping, jurisdictions, annexations, or addressing, please contact Tyler Hayaski in the Planning Department at the City of Semmes Public Works at 251-649-5752.